So Rudolph is desperate to guide the tractor on Christmas eve, but his nose won’t glow properly. Erma makes him an enormous apple pie to make him happy and promises him a good night in bed afterwards. She wants that new TV! How do you you get the structure of your story right? For your first draft, don’t worry about structure. Just get the story down. It will come out chronologically, that is, with the events in the order in which they happen. They may not stay this way, but that’s fine for now. Too many writers worry about writing a blockbuster with their first draft. You won’t. All writers have to write a second draft, so don’t try and avoid it. By now, you will have the basic story written, and hopefully the characters will be starting to interact naturally and seem real. You will also have enough ideas to keep the reader’s interest, but the pace may be uneven and the first few pages may seem a bit bland. The hook is really what happens on the first page, and probably in the first paragraph or even the first sentence. It is the bit that hooks a reader into wanting to read the whole story. Research has proved again and again that when a potential reader sees your book description, likes that and then decides to read the first page (as they almost always do in a bookshop, or on Amazon), they will decide within a few seconds, thirty at the very most, whether they want to read the rest or not. Santa asked Rudolph to meet with him. He then proceeded to tell Rudolph that he has lost his sleigh, so they will have to hire a van. Rudolph says okay but he has to check with Erma, because he told her he should always check any changes to his working conditions with her. …. The telephone rang in Rudolph’s apartment. Rudolph turned away from the bathroom mirror and ran to the phone. “My nose will never glow properly again!” he told himself. “I’ve lost my sleigh! It’s Christmas Eve. You know what that means? Now this is much better. First of all there is a lot of dialogue. Readers tend to prefer dialogue. They want the characters to show them what’s happening. They don’t want the narrator to tell them. It’s called ‘show, don’t tell,’ and is an important trick for story-telling. Basically people want to work things out for themselves. Good writing should have at least 50% dialogue, or monologue. You can see also that there is a sense of urgency and tension with the dialogue. And already we can see that Erma is going to be instrumental in the events that follow. How do you write a climax? First of all, you should work out in your head what sort of climax it is. If its action, then you will need to use many more action words like ‘ran,’ ‘desperately lunged,’ ‘screamed,’ ‘screeched to a halt,’ etc. Try to use shorter sentences at this part of the story too; it makes for more tension. By now the reader should have had all the insight they need into the main characters’ emotions and motivations, so you can spend much less time on this. Focus on the action and make the reader anticipate the moment of climax by building a scene of terror or dramatic tension or scenery. In our story it might be that Rudolph delivers all the presents on time and gets a big bonus from Santa. Not only can they get a really good wide-screen TV but he can take Erma on the honeymoon they never quite had (due to heavy work schedules at the time). A story doesn’t need to have a twist, but a twist can leave the reader feeling, ‘Wow! That was a great book!’ so you might want to try it. There is not much I can tell you about the twist, except that you should have planned it from the start and given readers small clues that something peculiar might happen. And then when it comes, it must be as big a surprise as possible. They will feel cheated if they either anticipated it, or if there have been no clues whatsoever that something was coming. Leave them gasping or saying “Wow!” and you have a fan for life! A really good example is the twist at the end of The Sixth Sense and. In our story it might be that Rudolph’s father was actually a farm reindeer, and so Rudolph turns out to be the best tractor driver ever! It might seem a bit obvious to say a story needs an ending, but it does need to be structured. It needs to leave the reader with the message you worked into the story (see the Themes tutorial) and don’t forget the character needs to show that they are changed of have learned something. You might also need to explain the twist a bit. But if you know there will be a sequel, you might not want to explain anything, but simply put the twist in the last sentence and leave the reader desperate to read the next book (as I have done in The Synchronicity Code). This is the moment when you want all the strands to come together so that the reader says, “Ah! Ha!”. Then they will be satisfied and want to read your next book. As I mentioned at the beginning of this tutorial, you might need to address other matters of structure during the second draft. The second draft is really where you take the first editing step; structural editing. If you are paying a very good editor, they will suggest these changes to you. But what is structural editing? If you have a lot of background and character building to get into the first chapter, it’s going to seem slow to some readers. Other readers won’t even buy the book, unless they get a feel for how good the climax is going to be. Fortunately, you won’t need to worry about this once the reader has read a few of your book. But how do you get round this problem with your first book? I have found that sometimes it helps to take a preview out from just before the climax and put it in near the beginning or even before Chapter One. For instance, in Ordo Lupus and the Temple Gate, the climax is a confrontation between the main character and his arch enemy. Fortunately for us, he has recorded what happened on a tape-recorder, so his wife can set down the events. This is done in the form of a small insert, in italics, at the beginning of each chapter. In this way, I feed the reader a taste of what is to come later, and make them want to read more. Judging by the reviews, this technique seems to have worked quite well. Lastly, I have discovered some very useful techniques used by movie makers. You might not want to try these ideas at all, but here is the structure for Gladiator. See how it develops the tension and keeps the watcher glued to the screen? You might want to try something similar with your books, especially if they are action adventures. See you next time when we discuss 5. Varying the Pace. And if you are wondering about the third draft, this will come later, in tutorial 6. Editing. Let me know what you think of my tutorials by commenting below. So, in our story about Santa’s sleigh problems, we have Santa, Rudolph, and Rudolph’s wife, Erma! Can you see some things wrong with this conversation? The both say, “Wow!” In reality, two people rarely use the same expressions as each other. Erma, being female, is probably younger than her partner (I am being politically correct here! ), so she might say, “Dude!” instead. ‘Rudolph’ is a name of 2 syllables, unlike ‘Erma.’ If they have been living together for years, she would probably have shortened it to save time. ‘Rudy’ is more likely. Males tend to be less expressive of their emotions at all times, so there will be less exclamation marks in their conversation. See how the dynamics have completely changed. Now we begin to see their characters emerge. I deliberately left in the word ‘too’ in Erma’s reply because it accidentally adds something Erma might add on purpose; if she wanted to be sarcastic and elicit a further response from Rudolph. Also note that I added a question mark at the end of her reply. She might be uncertain whether she had satisfied him; women are more sensitive to the emotional state of partners so they are constantly probing to find out what it is. They also like to engage in conversation more than men so add cues in this way. So you have seen how factors like gender, age, race etc. need to be taken into account in conversations between characters. And ALWAYS been vigilant for signs of them sounding the same. If you are unsure, swap the speech round. Pretend that Rudolph is saying Erma’s lines. If it sounds false, then you need to rework it. But those are only the basic rules. The reader will want to see character development. Frodo Baggins learning that pity can be a good thing and in general becoming so wise that the Elven folk invite him to go over the sea and into the West with them at the end. Luke Skywalker growing from a farm boy to a worldly Jedi knight. As in real life, this is a long process so don’t make it happen in the first few pages. Plan what things will change them and plan the scenes to show this. But in order to do this, you will need a sense of the person’s core character. It may seem a little odd to you but I will come to the character’s physical appearance last. The core of the character is what we are concerned with here. The trap that many writers fall into is to make the main character in their own image. In other words, the main character seems just like the writer. It’s very easy to do, and in fact, almost impossible to avoid completely. You need to develop a good deal of depth for the main character (MC), so it’s natural to draw on your own traits and experiences. But we all have sub-personalities. We all have a side that gets angry very easily or is prone to love too easily. As we grow, we learn to control these ‘sides’ of ourself. However, writing is a great opportunity to let these people back out into the open again. In fact, it’s one of the reasons I love writing so much! For instance, my main character in the Ordo Lupus books 1,2 and 3 is an ex-secret agent with the rare gift of being able to see Evil before it happens. He is also incredibly unlucky, but because of his talent is always able to survive and even turn these events to his advantage. I based these characteristics on myself. Although such moods or events are rare in my life, they do seem to happen. Readers seem to recognise these traits in themselves and many have written to me saying how much they identify with the MC. If you use this technique, you will find endless inspiration in your own life without giving too much away about yourself. If you are writing about somebody in a bad situation, writing about it as a sub-personality will also keep you more sane that writing about your whole self! This technique works equally well if you are writing about somebody of the opposite gender to yourself. For secondary characters, you could use sub-personalities of your self but I like to use 2 other techniques. The first method is to think of somebody you know well or have known well in the past. It needs to be somebody with whom you have laughed and cried with, or at least had an argument. Base your character on them, and use the same physical attributes if you like. If you are really bold, you can tell your friend you are doing this as a compliment. But ALWAYS change the name! Don’t embarrass somebody. Also be aware that if your friend knows that the character dies horribly or does something terrible, they may not like it. The second is to use somebody famous; maybe an actor or actress. This can work very well if the actor/actress is very well loved and has done great emotional scenes in movies or on stage. I have used this technique to good effect in one of my books. I left this until last because in many ways it is the least important factor. But a physical appearance can reinforce a trait and become an effective cue for the reader. For instance, dark hair or dark eyes can often suggest a malevolent personality. It’s probably a Western prejudice but nevertheless it exists. If you make a baddy blonde, good-looking and blue eyed, be prepared to make him or her really bad to compensate. Two examples that work well are Bond’s adversary (played by Xavier Bardem) in Skyfall and the priest assassin in Angels and Demons. My MC in the Ordo Lupus books 1,2 and 3 has eyes of a different colour. This not only suggests a weakness but also a strangeness and rare gift of sight. In general, you should always give a weakness or fault to a main character. Without this, it will be harder for the reader to identify with them. In our case, le’t say that Rudolph’s nose only shines brightly when he has had too much to eat and he is happy. So at the moment it is not shining, which means that he cannot guide the sleigh properly. See how you already feel sorry for him? Or at least, I do! Lastly, I always keep a separate word file filled with a list of characters’ physical and psychological traits. Not being able to find out whether you gave a character blue eyes or brown at the beginning, and having to hunt to find out can be very frustrating. Why is it taking me longer to publish my books? Actually, I know the answer, its a rhetorical question, but readers keep asking me this question so here is how I do it. Other processes might be better so please tell me what you do; I am eager to know! When I first starting publishing books, independently in 2006, nobody had any interest in my books at all. Apart from one short story, which a few kind souls told me had merit, I could get nobody I knew to read my stuff, not friends or even family. 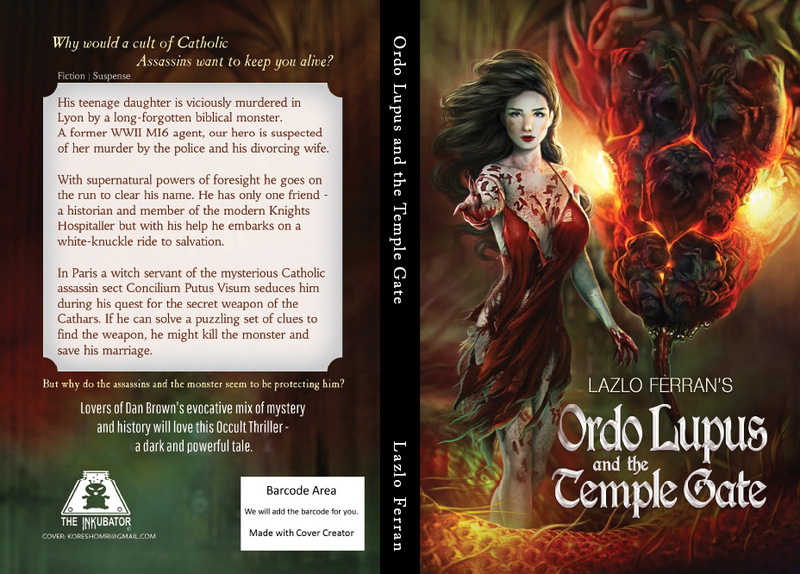 By the time of completion of my first draft for Ordo Lupus and the Temple Gate, things had changed. Several people were now interested and I felt lucky to have three readers of the manuscript (MS) before publication. This helped me a great deal to improve the book although I really had to bit the bullet because I needed, among other things, to cut 15000 words from the overlong manuscript. This resulted in a big improvement so I had learned that readers of your pre-publication MS, beta readers, can be a very useful part of the writing process. Since then, my writing has become an increasingly collaborative process, to the point where I will even send out chapters or passages to people, as I write them, for feedback. For a really first class MS, this saves time but when the MS is finished, that is just the first part of the process. If you are a writer and haven’t tried it, I thoroughly recommend you do get some beta readers and try collaborating. I am not suggesting your whole book should be decided by committee but having honest feedback about aspects of your book like; length, grammar, tone, characters and character development, the hook, the climax and the ending are all extremely useful. I believe the quality of my books and the sales figures have both shot up as a result. I think yours will too. Stage 5: (If you are lucky) final proofread. 1. You have probably already done this part or are doing it now. 2. As you can see, there are a lot of stages but it will be worth it! 3. After you get the first feedback from beta readers, you will usually have a long list of grammar mistakes and continuity mistakes as well as a long list of things the reader doesn’t like. This is the point at which you have to sit down and search your soul to find your own aspirations for the book. Sometimes, you feel you have written a world-shaking book, only to find that people think its a great adventure but no more. Sometimes you think you have written a simple adventure only to find people reading deep things into it. More commonly, readers will simply find some parts irrelevant or irritating and have big ideas for how the book can be improved. Twice, I have cut out more than 15000 words after hearing the feedback which sounds drastic but one wants the green light from the readers and if they all say its ‘too long,’ well, you have to cut! There are times when you simply say to yourself, “This book has a deep theme and, although nobody gets it yet, I am going to keep these bits in because I am sure I am saying something.” This can often mean a reader saying, “Okay but I will not be able to write a good review then.” That’s when its really hard to stand your ground. But that’s part of the process. Personally, I don’t want to write pulp-fiction and you may not do either so you are always going to come up against some resistance or reaction. In fact, I like reactions; it means I am saying something. 4. 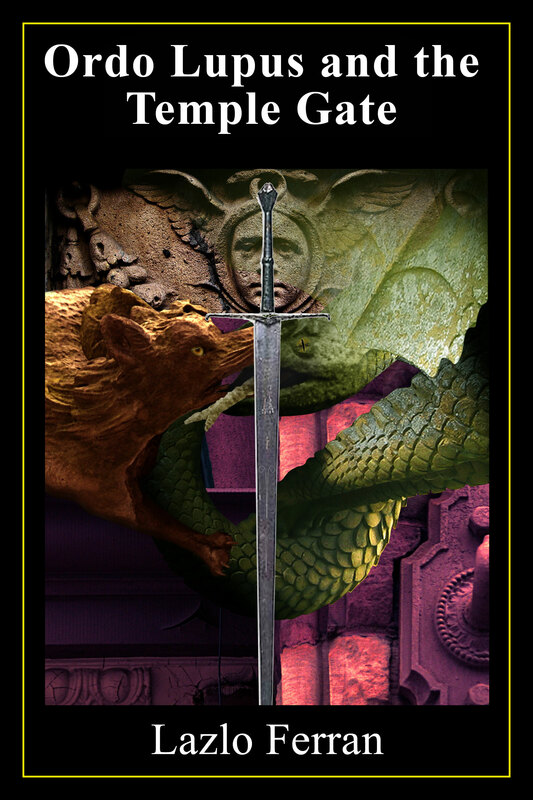 By now, you will hopefully have achieved the Holy Grail; approval from your beta readers. It doesn’t always come so celebrate! Now can send them a second draft. This needn’t be the whole book; most beta readers are doing it for free (I am lucky that mine certainly are!) and have a day time job to cope with as well. You have to take their commitments into account and have patience when waiting for their precious feedback. Don’t try rushing them! Usually, you will get positive comments at this stage, along with more typos and grammar changes. Be patient; it will all be worthwhile. Many of you will have seen writers who cannot take feedback well and I am sure most of us remember cases where such a writer has ended up removing their book rather be subjected to any more criticism. This is not the right approach! Take the comments in the spirit in which they are intended; to help you make a book worth reading. 5. So now you are ready for the proofread. Have somebody who is patient, loves detail and is good at spotting continuity errors read your final draft. 6. At last you are ready to publish! 7. But all the pain is NOT over! You will next find that not all reviews are positive. Some might mention the lack of climax or character development. Don’t ignore them, especially if the comment appears in more than one review. You can always publish a second edition if drastic changes are required; Shakespeare and Edgar Allan Poe certainly did. You might also find that some facts become out of date or even that linguistic fashions change. In my earliest book, for example, I wrote phrases like ‘in-control’ because that is how people spoke in 2006. They no longer do and the phrase now sounds weird so I took examples out recently. These are just examples of what you can change but keep your ears and eyes open. If you see an opportunity to change something for the better, make the change. However, you will never please everyone. I recently re-edited a book and took out a few commas here and there because some readers felt there were too many. Almost immediately, I received a review from a disgusted reader which said that there were ‘not enough commas’ and that they didn’t get beyond page twenty! Warning: make sure readers who have already purchased the book and new readers know that you have made big changes by releasing a new edition. If you don’t keep people informed, you are likely to anger them. In some cases, you might even want to keep the old edition available. 8. Finally, as Leonard Da Vinci said: “Art is never finished, only abandoned.” Never stop the process of revising work although I hope you will find you need to make fewer and fewer changes as time goes on. If you liked this article and want to contribute your opinions, please drop me a line below. 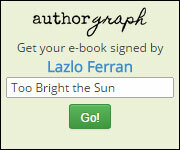 The best comment will get a free post on the Lazlo Ferran blog about the book of your choice! 17 Days to War may seem like an innocent phrase to you but it grates on me, as a writer, editor and reader. It grates especially because I know a thing or two about war, although I have never had to fight in one, for which I thank God in my heart almost every day! I am not a war-lover, despite writing fiction about it. I have an affection for the technology used but more than this, I love writing about people, people in difficult situations, and there are no more extreme situations than war. I would like to think it’s an emotive subject for anybody. That’s why it is particularly important that the BBC get it right. That’s why I was disappointed that the BBC – known as Auntie Beeb to some of us since childhood because of its supposedly ‘teacher’ attitude to delivering content. One is supposed to be able to rely on the accuracy and correctness of anything they show us. I think the Beeb made a shocking error here because their grammar is ambiguous and could mean something insulting. Why do I think this? Of course, such language might be part of this new trend to ‘dumb down’ everything for the masses. I hate the trend in adverts of taking good songs, even great songs, like All You Need is Love and not only getting a choir to sing them but actually changing the unusual original time signature to 4/4 and cutting out half a bar just so that ‘normal people’ can hum it more easily! How the hell did it become one of the biggest sellers of the 60s then if people couldn’t hum it! Are people becoming more stupid? Perhaps they will do if advertisers treat them that way. I also hate the poor grammar now used in adverts. All of this just makes BBC’s slip worse. The word ‘War’ can be a noun; 1- A state of armed conflict between different nations or states or different groups within a nation or state (ie Japan declared war on Germany), 2- A state of competition, conflict, or hostility between different people or groups (ie she was at war with her parents), 3- A sustained effort to deal with or end a particular unpleasant or undesirable situation or condition (ie a war on drugs). However, the usual construction for indicating a period leading up to war would be ’17 Days until War’, not ’17 days to War’. Nowhere can I find an erudite quote using that sentence construction. It seems to me that the BBC has erred shamefully here. And it’s not even a main title! Another word that is both a noun and a verb is ‘sleep’. It too is a state, can be a period in time and can also be something you do. But you wouldn’t normally say 17 hours to sleep because that can mean two things; 17 hours of sleep or 17 hours available in which to sleep. They are both quite different. Now if you say 17 hours to holiday, that can only mean that you have 17 hours in which to holiday. Can you say 12 hours to noon? It sounds weird. That’s because it is wrong! 12 hours to live makes you think of 12 hours left to live. You don’t say one month to Christmas. You say one month until Christmas. I would love to know that the BBC’s title is correct. But I don’t think it is and I think the meaning suggested by the phrase, ’17 Days to War’ is 17 days within which to make war! This is an insult to all those who suffered in the Great War or remember somebody who did. Not only that but it also contradicts the whole mood of the series, which aims to show how almost everybody did their utmost to avoid war. If I was a conspiracy theorist I might even believe that the War was deliberately started by the British Government and that the BBC is secretly trying to divulge this! Either way, shame on you BBC! Is there a specific grammatical rule for war and time that I don’t know of? I would like to think the BBC knows some archaic grammar rule regarding the word War. I would be a lot happier if there was one and I knew it. But have searched on the internet and I can’t find it. Perhaps there is, and if if allows the phrase 17 Days to War, please can you let me know?